Biomechanics covers a wide field such as organ mechanics, tissue mechanics, cell mechanics to molecular mechanics. 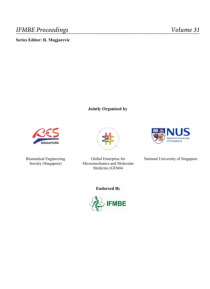 At the 6th World Congress of Biomechanics WCB 2010 in Singapore, authors presented the largest experimental studies, technologies and equipment. Special emphasis was placed on state-of-the-art technology and medical applications. This volume presents the Proceedings of the 6th WCB 201… 0 which was hold in conjunction with 14th International Conference on Biomedical Engineering (ICBME) & 5th Asia Pacific Conference on Biomechanics (APBiomech). The peer reviewed scientific papers are arranged in the six themes Organ Mechanics, Tissue Mechanics, Cell Mechanics, Molecular Mechanics, Materials, Tools, Devices & Techniques, Special Topics.